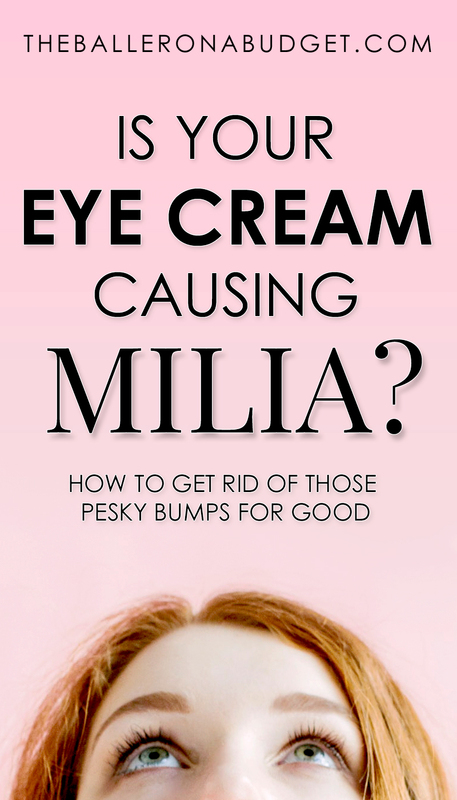 Is Your Eye Cream Causing Milia? “What are these tiny bumps around my eyes?” is one of the most popular questions my clients ask me. You might have them: tiny little hard bumps that look like small whiteheads but won’t go away when you attempt to pop them. That’s called milia. And they might be caused by your eye cream. While milia can be seen in other areas such as around the T-zone, cheeks and even on places like the neck, the majority of my clients who have milia are more often than not using an eye cream. 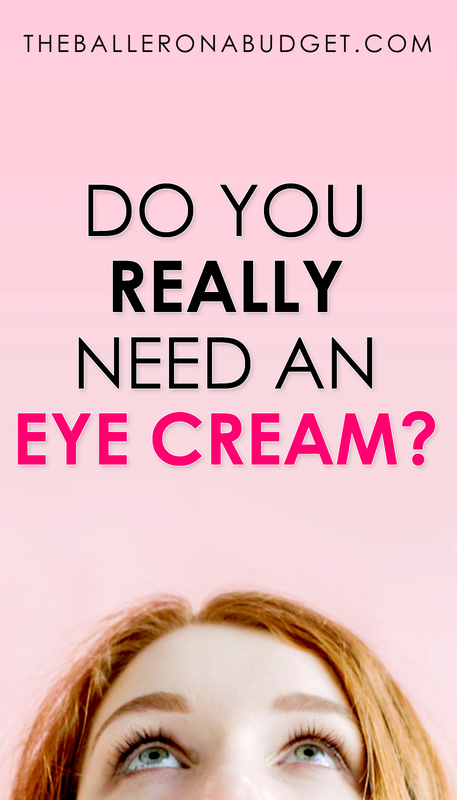 So this begs the next question: do you really need an eye cream? My professional opinion after 5 years of experience as an esthetician: no, you do not need an eye cream. While beauty giants like Sephora may push the latest and greatest eye creams that promise to reverse aging overnight, what I’ve seen on my treatment table tells me that your eye cream might very well be causing those bumps. Let’s break down why. Milia are tiny white or yellow cysts that appear like whiteheads but feel much harder to the touch, as they are a result of trapped keratin under the skin, which is a hard protein that is normally found in hair, skin and nails. They’re often found in groups. Milia can occur as a result of a variety of reasons, but one of the most common causes is when the skin loses its ability to naturally exfoliate and shed its dead cells as it ages. A second common cause is when the pore becomes clogged from keratin – think of it as similar to how a pimple forms, except instead of sebum, dead skin cells and bacteria, it’s sebum, dead skin cells and keratin. Milia can also be caused by sun damage, which is just another reason for you to wear sunscreen every day. Check out my other post on 5 benefits of wearing sunscreen plus 9 budget-friendly sunscreens. How Do Eye Creams Cause Milia? 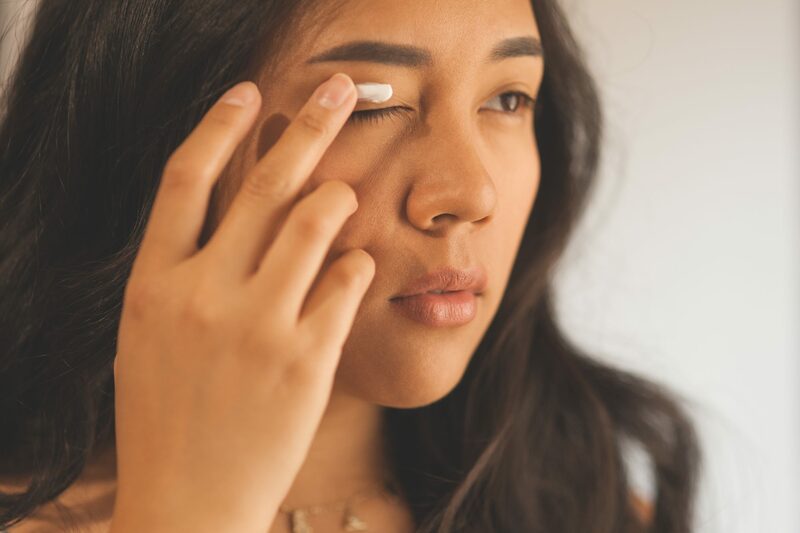 Eye creams are really just a facial moisturizer that’s packed with anti-aging and hydrating ingredients – I know, another marketing ploy to drain your wallet! But because eye cream formulations tend to be packed with ingredients, this also means that they’re too “occlusive” – meaning they’re designed to prevent water loss in the skin. Eye creams are usually packed with ingredients like petrolatum, silicones, mineral oil, or dimethicone, and since the skin around the eyes is significantly thinner and much more fragile, it may not be able to tolerate these ingredients. While congested skin might lead to overproduction of sebum or even acne, the pores in the eye area secrete less sebum, so the ending result is milia. Not everyone who uses an eye cream may get milia. Everyone has different skin and genetics, which means some people’s skin may be less tolerable to eye creams than others. If it works for you, great! But if not, it’s always fixable. Extracting milia is tougher than extracting a pimple, since the cyst is much harder than sebum-filled whiteheads. Your dermatologist can “deroof” them (cut them open and squeeze them out), but for a pretty penny – some dermatologists charge a sum per one milium cyst! If you’re dexterous, gentle and brave enough, you can do this at home with a sterilized lancet or needle. However, I recommend this since if it’s incorrectly done, it may lead to scarring or even injury. If you feel your eye cream is the culprit of your milia, take a break from it for a few weeks and see if the milia go away on their own. Your skin naturally exfoliates over time, so eventually they will go away. Keyword: gentle. Rough and abrasive scrubs can irritate milia – in fact, aggressive microdermabrasion treatments can actually cause more milia! Try a peeling gel to get some gentle daily exfoliation. They’re not a chemical peel nor a scrub: they use fruit-based enzymes to gently dissolve dead skin cells. All you have to do is apply the gel to dry skin and rub it around for 30 seconds and then rinse off. Use it like a scrub! So now you’re probably wondering: what can you do to prevent fine lines and wrinkles from appearing around your eyes? Well, because an eye cream is really just a type of ingredient-charged moisturizer, its main job is to hydrate, which isn’t really addressing the crevasses being formed in the skin. A better solution: try a retinol serum or an acid. Retinol serums encourage a faster renewal of skin cells to come up to the surface while also promoting collagen production, something our body gradually produces less of as time passes. Collagen helps to plump up the skin and increase elasticity, which gives wrinkles a more “filled-in” appearance. Using a retinol serum gives you the bonus of being able to achieve an overall smoother complexion, not exclusively just around the eye area. A great budget-friendly retinol serum to try out is The Ordinary’s Granactive Retinoid 2% Emulsion. It’s a low-strength retinol serum that has all the smoothing benefits of retinol minus the irritation. Use this during your evening regimen only and always remember to wear sunscreen during the day as retinol use may increase sun sensitivity. If dryness is also one of your eye care concerns, consider using an acid-based product to slough off the dead skin cells at the topmost layer to allow products to deeply penetrate the skin. Never use a chemical peel on the eyelids or too close to the eyes as this area can experience severe irritation and burning! I highly recommend using acid-based products like facial cleansers or toners to ensure safe use, especially if you’re new to acids. A great introductory acid-based toner to try is The Ordinary’s Glycolic Acid 7% Toning Solution. Not only does this help with achieving smooth skin and preventing fine lines, but it can also help reduce the appearance of large pores and balance oily skin. You can also try Peter Thomas Roth’s Un-Wrinkle Peel Pads: It is a bit stronger than The Ordinary’s Glycolic Acid Solution, so I don’t recommend using it on a daily basis as it may dry your skin out. And if you are sensitive or new to acids, try Mario Badescu’s Glycolic Foaming Cleanser before anything harsher. If deeper wrinkles are your concern, your best bet is to ask your local medical spa for chemical peels designed for wrinkles around the eye area. Several types of TCA peels can also help achieve the desired results. Lastly, if you’re concerned about dark circles or crow’s feet, you might want to consider getting a derma roller. This device creates tiny injuries in the skin, which forces your skin to produce copious amounts of collagen to heal itself. The result? Plump, radiant skin. Use derma rollers with needles that are 0.25 or less – any more can cause injury to the eye area. Do not roll over your eyelids. Roll only around and underneath the eyes and be sure to soak the derma roller head in rubbing alcohol both before and after use. Added bonus: Derma rollers are great for acne scars! I shared my experience with derma rolling for my acne scars a few years ago. Read it here: Banish Acne Scars: Product Review + My Professional Life With Acne. If you have oily skin, you’re better off using your moisturizer as an eye cream and wearing sunscreen to prevent any wrinkles or signs of aging. Tacking on an eye cream on top of your moisturizer may be too much for oily skin. If you must use an eye cream, opt for a gel-based eye cream or eye creams that are lightweight and easily absorbent. Be sure to look for eye creams that also contain retinol to help not just provide moisture but also boost collagen production. What’s your take on eye creams? Let’s chat in the comments and don’t forget to subscribe to my newsletter below for more beauty tips and tricks. DONT USE neutrogena Rapids wrinkle eye cream. I thought I finally found “the one”, but after 2 weeks applying on maybe eye…all of a sudden it have given me MILIA. What eue cream can you use if you donhave milia? Sorry, I meant what eye cream or gels can you use if you have milia?